1 Is it possible or not? 2 What sneakers should not be washed? Sneakers - shoes primarily for energetic people, leading an active lifestyle. Often there is a need to wash sneakers, as they quickly become covered with dirt outside and then inside. That is why the question of how to wash the sneakers in a washing machine is so often encountered. Unfortunately, many people who lead an energetic life simply do not understand how you can wash out the sneakers in the washing machine, and if this is possible. We argue that to do this is more than realistic! In the following guide, you can learn all the secrets and useful tips on how to wash your sneakers in a washing machine so as not to spoil shoes and home appliances. Are you ready to find out everything you need? Before you continue reading, you need to finally figure out whether you can wash your sneakers in a washing machine, or better clean your shoes by hand. All doubts are connected with the features of the structure of sports shoes - it includes a sole made of rubber or foam soles, as well as glue, fabric (or leather). The main risks are that the shoes after washing can tritely fall apart or lose their original shape. Therefore, the question arises whether it is possible to wash the sneakers. Most manufacturers of sports shoes in one voice say that sneakers after washing necessarily lose their shape and integrity, and for this reason they can not be washed. Information about this is usually placed on tags, as well as in the instructions for cars. However, you can wash your sneakers, if you approach this matter wisely. Before you wash your sneakers in a typewriter machine, carefully read the following recommendations so that after washing you get shoes in the attractive form in which you put them in the drum. What sneakers should not be washed? Cheap with glued parts, made in questionable industries. Genuine leather - this material does not like aggressive washing and cleaning products. Equipped with light reflectors and other decorative elements (may fall off). Damaged - peeping foam and unreliable seams will only aggravate the situation. Before washing the shoes in the washing machine, check the machine carefully - the condition should be at least good. If you have noticed the protruding elements of the sneakers, or fake seams (that is, the shoes are glued), it is better to wash such sneakers in manual mode. Clean the outer surface of the shoe from pieces of dirt, dust and debris, paying special attention to the sole of the sneakers. If you do not have time for thorough preparation before washing your shoes, simply wipe your sneakers with wet wipes. You can also make soaking shoes - if it does not fall apart, you can load it into the drum. Is it possible to wash the sneakers in the machine as a whole? Not recommended! Before washing, be sure to remove the laces and insoles - they should be washed separately from the shoes. Before you wash your sneakers in a washing machine, find a special bag made of thick fabric that is designed specifically for this purpose. Load shoes in the machine only when placed in such a bag - so the shoes just will not fall apart. If you follow the above tips, the question is, is it possible to wash shoes in the car machine, in front of you will not rise! Now you can proceed directly to the wash. If your washing machine has a mode designed for washing shoes, do not hesitate to choose it - the device will select the appropriate washing mode. If there is no special mode in the typewriter, choose delicate settings. Set the temperature control knob to 40 degrees. Is it possible to wash the sneakers in the machine machine at higher temperatures? No, it is impossible - it can lead to deformation of the sneakers, as well as washing out the color, so keep the temperature. Discard options such as drying and spinning. A strong mechanical load during the spinning of shoes will inevitably lead to its deformation, and drying implies a high temperature, the negative consequences of which have already been mentioned in the council above. Before as wash sports shoes in the washing machine, look at the tag on the sneakers. Perhaps this will be all the necessary information about the mode of washing and drying. After washing, remove the shoes, then push the dry paper, previously rolled up into lumps, into it. Do not use newspapers or similar paper materials for drying, as the paint from paper may be imprinted on sneakers, spoiling their appearance. When the shoe is filled with paper, it can be left to dry. It is important to avoid sneakers near heat sources, as well as under the direct rays of the sun. Just leave the sports sneakers in the room and wait for them to dry completely. Now you know not only how to wash your sneakers in a washing machine, but also how to dry them properly. However, these are not all questions that should be addressed. What else to remember? Do not wash your shoes at night. The fact is that you can wash your sneakers in a typewriter and at night, and at any other time of the day, but when washing shoes, the washing machine makes loud noises that can wake you and your neighbors, causing trouble. Wash without fanaticism. Many people are interested in whether it is possible to wash shoes in a typewriter machine, while loading several pairs at once. It is categorically impossible - more than two pairs at the same time laying in the drum is strictly prohibited (sneakers can deteriorate). Use dry powder. Of course, you can wash your sneakers in the washing machine and dry powder, but the granules can ruin the shoes. Choose a liquid powder. So, we figured out whether it is possible to wash the sneakers in the washing machine, how to do it correctly and what actions will lead to quick and efficient drying. But what to do if washing in a typewriter is prohibited, and you do not know how Wash sneakers by hand? Pay attention to the topic. How to wash sneakers manually? Very simple! To do this, prepare a basin with water heated to a temperature of 30-40 degrees. Wash athletic shoes using quality liquid powder (if the shoes are white, you can add a little bleach). If there are no special tools at hand, you can use ordinary soap. Drying is similar to the above. Many people ask how to wash Reebok sneakers, as well as shoes from other manufacturers that use special materials and technologies in the manufacture of sports shoes. So, leather sneakers do not need washing at all - it is enough to wipe them in time with the help of wet wipes, as well as lubricate with a special cream. 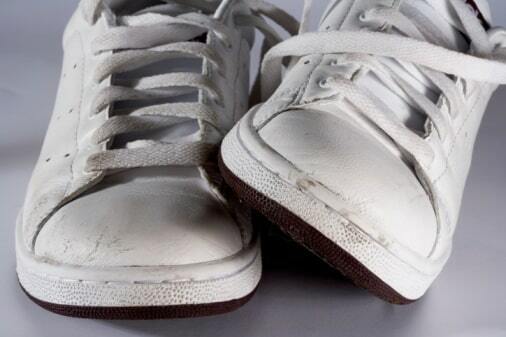 If only leather inserts are made of leather on shoes, then such sports sneakers can also be washed - it doesn’t hurt. It is not necessary to wash the sneakers, which are equipped with a water-repellent coating, as it is almost always washed after washing. However, this coverage can always be returned by using special sprays that can be bought in the store. Always follow the instructions in the manual, and then washing the shoes will not be a problem! I always wash sneakers and sneakers typewriter. Pre-soak in powder. And then throw in the machine. I try to put something soft, so that the sneakers do not wear out on the drum. I used to be surprised by people who wash their sneakers in a washing machine! Now I wash myself this way!